Above: The above is a sample of a page from The Apostolic Bible Polyglot Old (LXX) Testament. 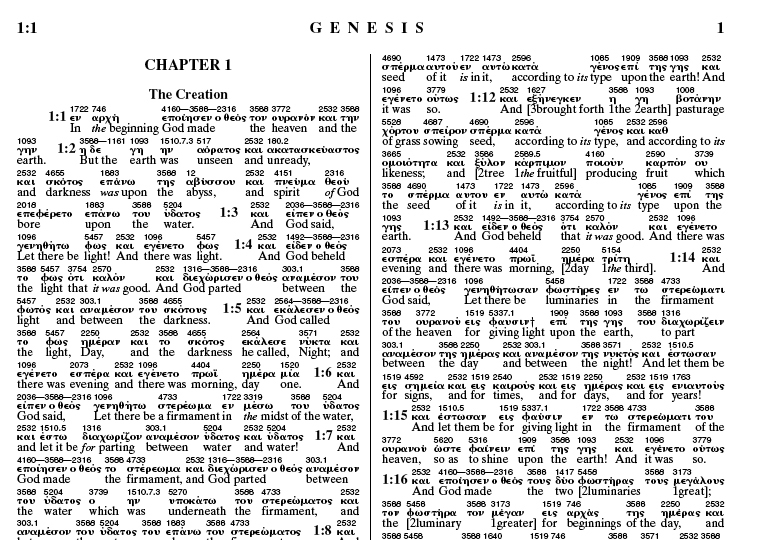 The Apostolic Bible Polyglot is a numerically coded Greek-English interlinear Bible with auxilliary works. Each Greek word in the text has an AB-Strong number above it and an English word below...see example above. The AB-Strong number corresponds to the numbering system of the 1239 page Apostolic Bible Polyglot Old Testament (LXX) (which does not contain the Deutero-canonicals), the 374 page Apostolic Bible Polyglot New Testament, the 364 page Lexical Concordance of The Apostolic Bible Polyglot click here, the 88 page English-Greek Index of The Apostolic Bible Polyglot click here, and the 419 page Analytical Lexicon of The Apostolic Bible Polyglot (available via the CD-ROM and Full Download only) click here. The Old & New Testament text is free, but the Lexical Concordance, the English-Greek Index and the Analytical Lexicon are for purchase on the download page accessed by filling out the form below. All of the above are also on a CD-ROM available at the BOOKSTORE. The printed edition, available on the BOOKSTORE, contains the English-Greek Index and the Lexical Concordance, but NOT The Analytical Lexicon of The Apostolic Bible Polyglot. The Apostolic Bible Polyglot Old & New Testaments may be freely obtained by the top two links, or a donation may be made by changing the amouth from $0.00 to whatever you wish to donate. The other three works of The Apostolic Bible Polyglot may be purchased at the same time. After you have selected your choices, viewed the shopping cart, filled out the information and submitted, you will be taken to our "successfully registered" page which instructs you to check your email box for the download link. Each download has a separate email with link. Your email address will be added to our notifications, updates and comments list which you may opt out of at any time by contacting us at apostolicbible.com. Having the Apostolic Bible Polyglot on an electronic device is very handy, but consider having a printed edition in case Rev. 13:17 takes place tomorrow.